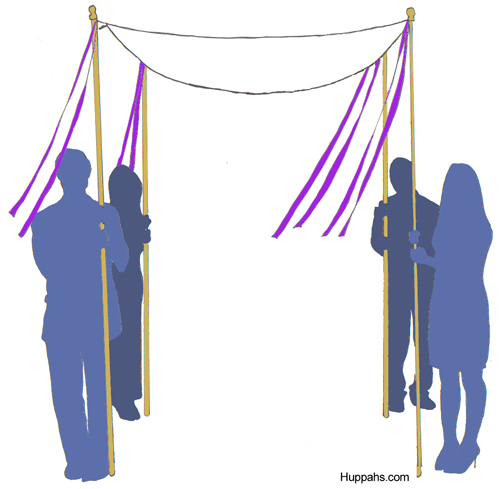 Check it out: Instructions for making your own version of Huppahs.com’s most popular huppah style, Simplicity, can be found in the book Sew Jewish: The 18 Projects You Need for Jewish Holidays, Weddings, Bar/Bat Mitzvah Celebrations and Home. The book is by the designer behind Huppahs.com. Find it on Amazon.com. Picture this dress in eyelet lace for a casual but chic backyard wedding. Shabby chic or bohemian feel, especially. The design is called Laurel, and the sewing pattern is the newest release from Sarai Mitnick at Colette Patterns. And great news: The sewing level is “Beginner.” You can order a paper version of the pattern or download it. DIY brides and Kate Middleton fans: Butterick Patterns has released a pattern for a Kate Middleton-inspired wedding dress. The design features the high lace collar, tight bodice, and pleated skirt we know and love from the Duchess of Cambridge’s royal wedding. Pippa Middleton inspired bridesmaid dress pattern from Butterick. And yes, Butterick also offers a Pippa Middleton-inspired bridesmaid dress pattern in sizes 6-22. Difficulty rating: Average. Grace Kelly-esque pattern from Vogue. The Traditional French Wedding: An Endangered Species? Are you weighing the pros and cons of live music versus a DJ for your wedding? Are you considering a custom iPod music mix for the cocktail hour or dance party, like I wrote about in my previous post? Recorded music can really stretch your music budget, but few details elevate the atmosphere of an event more than live music, so if you don’t have live music for the dinner reception and dancing, try to find room in the budget to add an element of live music during the ceremony, and the cocktail hour, too, if you can swing it. If you’re planning a Jewish wedding with a bride’s reception or you’re planning to sign the ketubah in front of all your guests, consider having live music during those events also. 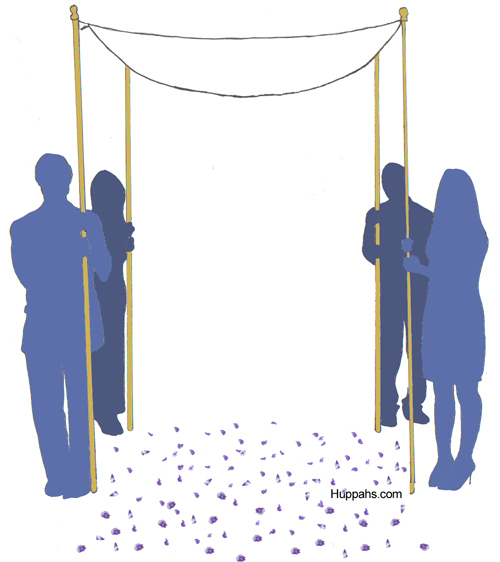 For my own wedding, we hired musicians to play klezmer music while escorting the groom from the ketubah signing to the bride’s reception for the veiling. 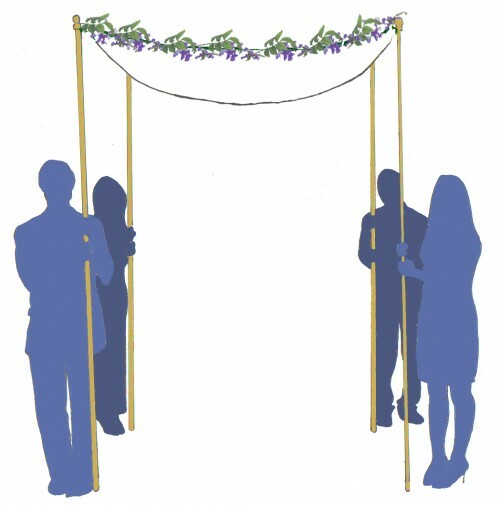 It was a lot of fun and really ramped up the party’s energy as we prepared for the ceremony under the huppah. You could go with a small trio or quartet, but even a single instrument playing during your procession can heighten the emotional intensity of the moment, taking your breath away and tugging at your guests’ tears. Find musicians on wedding planning websites, the music departments of a local college, or through friends’ recommendations. Am I missing your favorite? For those shabby chic wedding self-stylists out there — and I know there are a lot of you — take a look at this easy DIY burlap banner project posted by Megan White, one half of the event planning duo Social Graces, based in Springfield, Missouri. 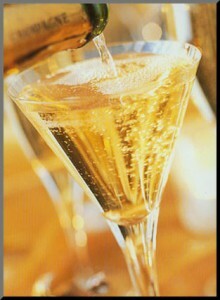 The project appears on the company’s website, eventsbysocialgraces.com. 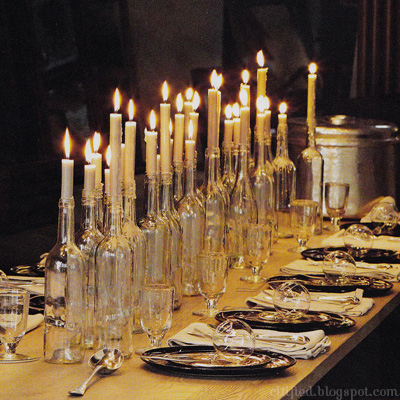 A tablescape of wine bottle candle holders. Great for evening weddings in the approaching cooler seasons. Plenty of other folks seem to have been inspired by this image; I traced it back through more than a half-dozen blogs and websites to its origin on This Is Glamorous (http://citified.blogspot.com). The photo is by Tom Mannion. Looking for more table decorating tips? Take a look at 7 Tips for Designing Stylish Long Tablescapes on a Budget. 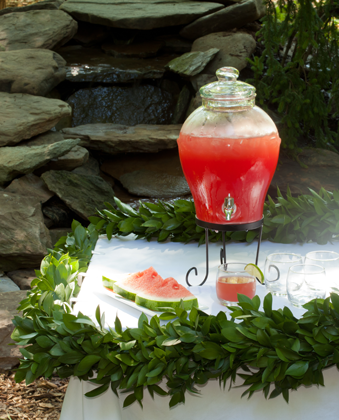 You’re going to love this cool, tasty wedding punch. We developed it to celebrate the recent launch of our Facebook page, and we’re pleased to share it with you here. 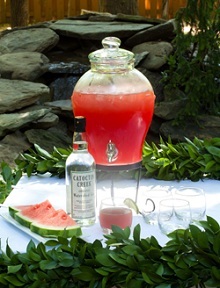 The punch features refreshing watermelon and Watershed Gin from Catoctin Creek, a new award-winning artisanal distillery in Virginia whose liquors are both organic and kosher. 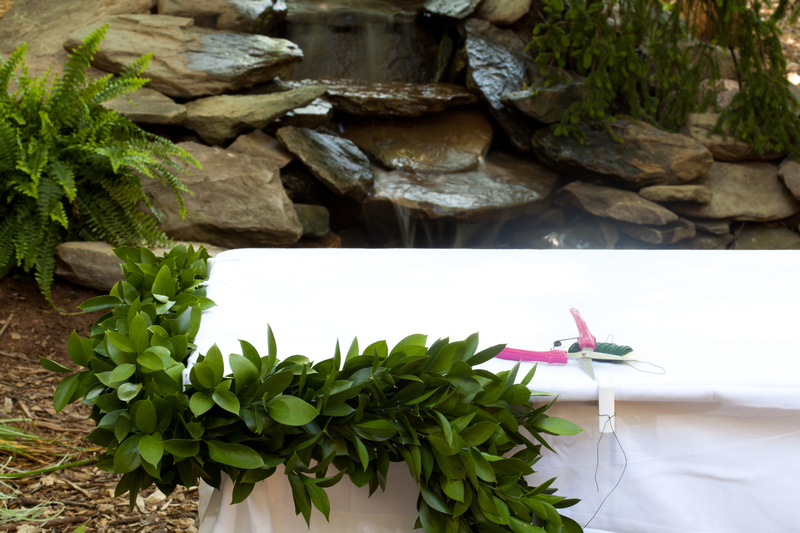 Want to know how to get our lush garland look for your own wedding table? Check out How to Decorate a Table with Garland. Cut the watermelon in half and scoop out the fruit into very large bowl. Use an immersion blender to liquidate the fruit. Strain through a cheese cloth. You will end up with about 42 oz of watermelon juice. Combine all the ingredients. Add the seltzer and ice to the punch bowl just before serving. Let me refine the title of this article: it should be “How to Decorate a Table with Garland WITHOUT Putting Holes in Your Table or Your Tablecloth.” The conventional method of attaching garland to a table requires sticking pins into the table through the tablecloth. Not ideal, especially when the table and tablecloth are your own. 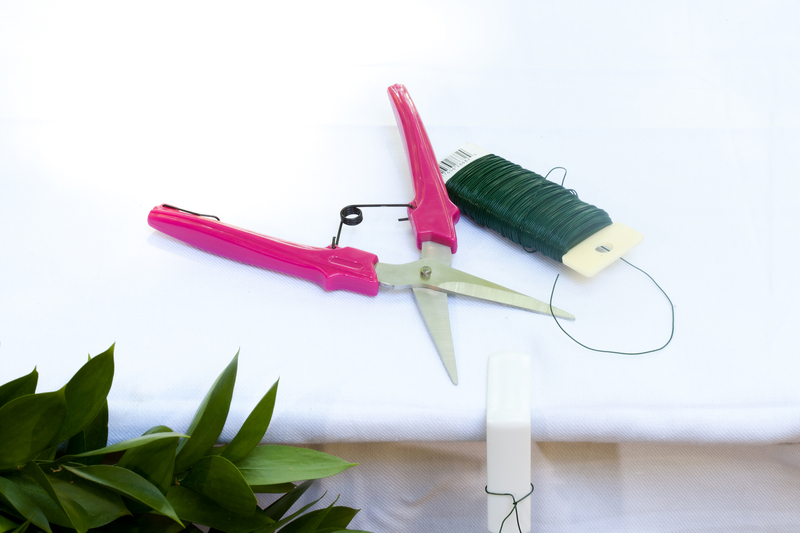 To style our wedding punch photo shoot we avoided putting holes in our cloth and table by attaching the beautiful Ruscus garland with tablecloth clamps. The key is to use heavy duty metal clamps rather than the plastic versions. 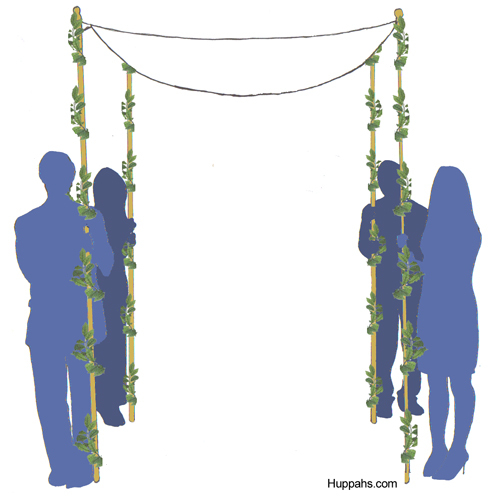 Use pieces of florist wire to attach the greenery to the clamps. And here’s the recipe for that tasty watermelon punch.